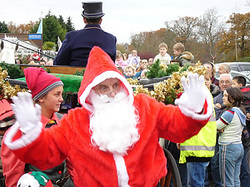 Christmas Day 2010 gave a surge in hits to the CliMAX website and a maximum for the winter period. Not content with over-indulgence in food and drink and time spent with family giving and unwrapping presents, the CliMAX-community felt compelled to keep up to date with the CliMAX-Project. A peak of curiosity leading to another peak of excitement for cricket lovers, we hope. 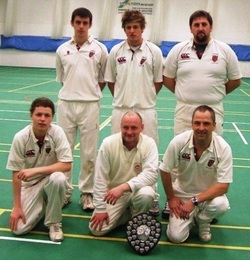 Fielding two CliMAX-Originals (Robbie Baker and Callum Stewart) Hatherley and Reddings Indoor Cricket Six were unstoppable in the Cheltenham Indoor Sixes Cup competition this winter. 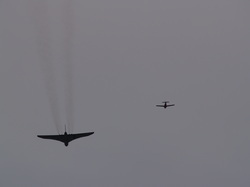 Robbie Baker showed the benefit of his CliMAX experience with two MAXimums opening for H&R in the final. Only rewarded 6 each for these, he still mustered nearly half the runs needed by Hatherley to overthrow finalists Aston CC (87 all out). Dan Jones who failed to take the CliMAX challenge during 2010 was clearly inspired by Robbie and hit the first ball of the last over for another MAXimum to secure the victory. 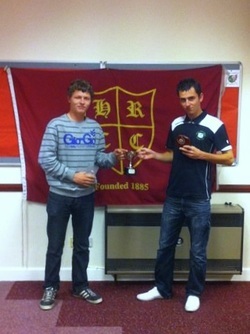 More silverware for H&RCC. We wish you a Happy Christmas and hope that you were lucky this morning, receiving a beautifully gift wrapped CliMAX-Board game and have already spent an exciting hour or two getting to grips with the rules and - of course – reaching a CliMACtic finish to your first matches. We would love to have reports of your first experiences and could potentially use them here on the website - contact us. Remember CliMAX is not yet 12 months old and so 2010 is the first Christmas any cricket lover has reached this kind of peak of excitement. Yes, we are still making history together, so lets celebrate like never before. Should your lover have been unaware of the importance of this then there is still a chance to purchase CliMAX-Board and you could still be developing your tactics during 2011 in time for doing the real thing in the summer. Contact us if you would like to purchase CliMAX-Board in the UK – currently £20 + Post and Packaging. Customers abroad should order directly from the Game Crafter website. Due to unexpected volume of sales in the run up to Christmas CliMAX-Board has sold out and game producer The Game Crafter have run out of the pieces used by Ace Wicketkeepers to save byes, so once they have put together the current order and shipped this, we will have to wait for further supplies to The Game Crafter before we can order more. Those of you who ordered before 12th December 2010 can still expect delivery by Christmas, but delivery time on new orders is likely to be several weeks. Apologies for the inconvenience! Not only have we got one CliMAX-Original, Nat Gregory the CliMAX-Kid, in Australia spreading the good news, but we also have Will Noble in Argentina doing his bit. Will has sent us a number of photographs of cricketing facilities in Argentina which you can see by clicking on a the photograph of the Hurlingham shirt. Nat’s adventures in words and pictures can be followed by clicking here. Don’t miss the saga of the shark that got away! The Stratford Herald have followed up match reports of the first CliMAX matches and tournament held during the summer with an announcement that of the CliMAX-Board being produced in America. The article goes on to explain how dice are used to produce realistic scores and enable tactics of CliMAX to be explored whilst playing the newly released board. The newspaper acknowledges that the player business cards feature local players and the full article is printed in the 18th November 2010 issue. After the initial run on CliMAX-Board some other CliMAX-Originals have been introduced, whilst others are left out. This means those that were quick of the mark have a collectors’ item special first edition of CliMAX-Board. The change in personnel on the CliMAX-Board player business cards raises the possibilities that swaps may be made to ensure owners have the options they want when selecting their teams. Perhaps packs of player business cards will be sold separately and perhaps clubs may wish to submit their own photographs and details of players to feature on individualise sets of business cards. For quote contact us. CliMAX-Board can be purchased from Game Crafter or via this website if you need delivery in United Kingdom (add to cart). Known for his deft use of a bat called the Mongoose, Josh Collins was rewarded for his outstanding all-round performance in the CliMAX-Pairs tournament in the summer. 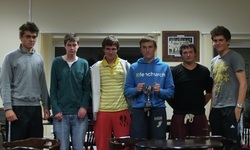 With new boy Dan Beasley, he smashed a strong field including Tom ‘Ducky’ Clarkson and CliMAX inventor Peter L Gregory. The Trophy was again presented by Joe Page to Mongoose last Friday night at the Ebrington Arms where the cricket club held its Annual Awards Dinner. Club Chairman, John ‘Bunny’ Baldwin noted the impact that CliMAX had had on Ebrington Cricket Club since its launch early in the 2010 season and pledged the support of the club to Peter Gregory and the CliMAX-community in forthcoming seasons. By congratulating Peter on bringing out CliMAX-Board in time for Christmas, he caused a sudden surge in sales and potentially a rise in share price (if there were any shares). 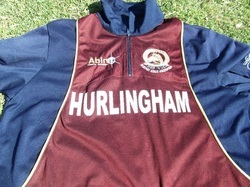 Click here for photographs of the Ebrington CC Annual Awards Dinner 2010. CliMAX star shines down under! The bowler Gregory appears to have been considered as a late and desperate option by skipper Scott Fowler, but CliMAX bowling mentality looks to have served the 18 year old well. Un-phased by leaking runs, Gregory kept looking for wickets and although he went for 14 in his penultimate over, with Dardanup CC needing only one run to bring the scores level, he had X Green caught behind for a famous and tightest of victories. With bowling figures of 3 for 40 to add to his 43 runs off the bat, Harvey-Benger Chairman Craig Maughan must be delighted with his overseas player and surely Gregory is worth every penny of his CliMAX-Board value - £300,000? Two of the most exciting young CliMAX-Originals have been given the awards as Best Batter (Robbie Baker) and Best Bowler (Jack Edge) in North Gloucestershire. 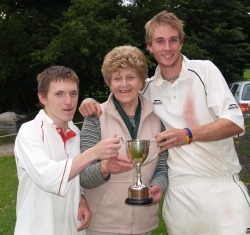 The twosome are pictured here with the Champions Trophy won by Hatherley and Reddings Cricket Club, which hosted the first major tournament of CliMAX away from Ebrington in the summer. CliMAX-Board offers everyone the chance to play the CliMAX-essentials rules in their own living room. CliMAX-Board simulates the real thing using cricketer business cards, dice, a board, 5 ace wicketkeeper pieces and batting tactic cards. 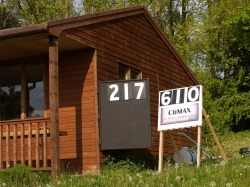 CliMAX-Board comes with full instructions, including the CliMAX-essential rules, and 5 match scoresheets. CliMAX-Originals are featured on the set of cricketer business cards and are valued between £10,000 and £300,000, with players invited to select a team worth up to £1,500,000. Though dependent on the roll of a batting and bowling dice, the outcome is influenced by selection of a balanced and skilled team and the timely choice of tactics while batting – aggressive but risky hitting, obdurate defence or a balance between the two. Make your purchase from The Game Crafter. 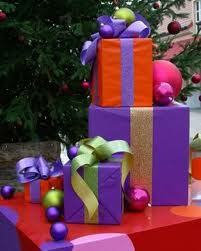 For orders in United Kingdom contact us for a chance to reduce the impact of shipping costs. Let us know the address you would like to receive CliMAX-Board and we will reply with a quote. You might need to allow 28 days for this method of ordering. Prolific batter Na(i)t Gregory’s exploits must have been heard about in Western Australia, by Chairman Craig Maughan who phoned Nat(e) after the Ebrington game against Coventry West Indian Wanderers and asked him to come and strengthen the Harvey Benger team for the season starting on 23 October 2010. Nat(e) will be full of confidence when he arrives at Perth on Wednesday morning having scored 228,089 runs at an average of 28,511.1 in the inaugural CliMAX season. Na(i)t, only 18 years old, claims his game has developed rapidly this season due to the opportunity and challenges that CliMAX has provided him. Testimony to that impression, his record for Ebrington in traditional cricket is also impressive this season (780 runs at 96.5). The CliMAX community wish Nat well as he flies off to Oz and hope that he can use the opportunity to spread the word of CliMAX down under and that we soon have match reports on this website from outside England. James Harber's incredible achievement scoring over one million runs in one over at the Hatherley and Reddings CliMAX-Sixes in September is reported in the Painswick Beacon October issue - check out this link and go to page 18. 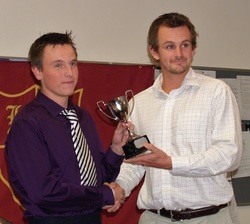 Professional cricketer and captain of Gloucestershire County Cricket Club presented Nathaniel Gregory captain of the Marrows with the Hatherley and Reddings CliMAX-Sixes trophy at the presentation evening on Friday 24th September 2010. In the most recent survey, 99% of housewives stated that they didn't mind their husbands (partners) CliMAXing on Saturday afternoon as long as they knew who he was with and when he was playing away! Please take part in the on-going survey by clicking here and submitting your answers by clicking the on-line poll. Alex 'Tommo' Thompson had had such a disappointing season. Granddad (Ken) has frequently lamented on how good the boy was as an U16, but how he had failed to live up to expectations. Just four weeks ago he contemplated giving the game up, but then after a period in self imposed exile, missing the Hatherley and Reddings CliMAX-Sixes tournament and the games against Temple Grafton, he was enticed by skipper Clarkson to try on the whites once more. The most discerning fan could see there was a new spring in Tommo's step during a partnership with Nat(e) Gregory. A cocky Dilshan scoop and a forceful on-drive smashed into the boundary railings, but there was more to come. Second change at the Campden Road end, Tommo, the man (not boy), came on to bowl from an uncertain run up and with an undetermined style. What proceeded was a series of outrageous experiments; slower balls out of the back of the hand, slow bouncers, wildly swinging full bungers, seamers bowled off the shortened "I'm bowling spin cos it is too dark for my pace" run up. And as unlikely as it seems, every experiment worked. Blockley batters was tricked, hoodwinked, bamboozled and generally made to look totally foolish by Ebrington's premier all-rounder who finished with 6 wickets for only 12 runs. In the week that we were saddened to hear the news of Freddie Flintoff's retirement it a appears that a new star has been born. 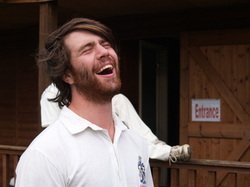 The match between Ebrington and Blockley cricket clubs may not have been CliMAX, though for Tommo it definitely was! Discover more photographs of the presentation of the Brian Gee Trophy to Ebrington CC after their crushing 195 runs win over Blockley here. On Monday 13th September there were 125 hits on the pages of this website, the peak of interest since the Hatherley and Reddings CliMAX-Sixes tournament and probably included a few interested in the result of the Classic-CliMAX between Ebrington and Temple Grafton. This game was reported in the Gloucestershire Echo on Tuesday 14th September. However for amusing commentary on that game, but honest reflection on the pros and cons of CliMAX from two novices read the news section of the Temple Grafton website. Temple Grafton produced a thrilling game in their first experience of CliMAX on Sunday 12 September at Campden Road, Ebrington. Grafton batted first and were still in a state of utter confusion about the new rules explained to them only minutes before by Peter Gregory. They lost 6 wickets in three overs but Powell and Hopkins began to rebuild allowing a time-out on 41 after 5 overs. Ebrington used up only 2 overs in reaching 36 for 1 before inviting Grafton back in. Hopkins and Powell took their score to a respectable 92 and were beginning to wonder if they had enough when Rich Bryan took a catch off Fred Rawlings. Gibbons, with great confidence, took 135 from the last over to set a reasonable target for the Yubby batters. Nat(e) Gregory and Ben Pigott resumed, but Pigott was on his way back after 3 deliveries. With Brad Wrench, Gregory worked the ball round, until with 42 on the board, Gregory went ballistic again. For the second week running he scored over 100,000 in an over. Shortly he retired hurt, but the hurt was probably more with the unfortunate bowler. When the crafty offy Young, broke the partnership saving his team 111,212 runs and becoming instantly the most successful bowler in CliMAX history were in trouble with a shortage of overs to restore their total. Now the Grafton bowlers were full of confidence and they worked through the all the Ebrington batters finally bringing Gregory back to the crease. Now 136 were needed and 3 balls were left. When the first just cleared the midwicket boundary, Gregory sniffed a chance. The second came off the middle and now 26 were needed from the last delivery. Gregory inhaled possibilities. Then the improbable happened and the third one sailed high on the bank. With a game not allowed to finish on a MAXimum Gregory just had to make sure he didn't pop up a catch or miss a straight one. The extra delivery was safely negotiated and Ebrington came out on top, though the winner again was the game of CliMAX. Look out for the CliMAX clash at Campden Road, Ebrington this Sunday 12th September. Temple Grafton CC have accepted the challenge to play Ebrington CC in the CliMAX-classic format (10 by 10). A fascinating end to this first season of CliMAX is promised as the clubs are well matched a usually produce fine cricket in their annual double header. Ebrington CC pipped them early in the season, but it went down to the last over. As Grafton plot their revenge a call for players comes on their website. This will probably be your last chance to CliMAX in 2010 - don't miss it! The Hatherley & Reddings CliMAX-Sixes tournament has been reported in the Stratford Herald this week and on Saturday 11th September the news of CliMAX was included in the more widely circulated Gloucestershire Echo. This activity in the media matched a surge in hits on this website of over 80 per day. Read about the success of Mike Cuppers team of Hatherley & Reddings Cricket Academy players and their coaches plot to triumph in last Sundays CliMAX-Sixes tournament. See more photographs by Charlotte Gregory. Andy Edwards, Vice Captain of Hatherly and Reddings brought a strong team to the CliMAX-Sixes tournament, but was pipped by the Marrows in a tight final. More details and photographs are available. A team from Chipping Campden School, known as Marrows, overturned the combined strength of Hatherley and Painswick in the dangerous underwater team of Sharks in Hatherley and Reddings CliMAX-Sixes on Sunday. The teams resorted to a white ball and dispensed with the site-screens in order to play the final in such darkness that the spectators and scorers were left guessing what was going on in the middle. Incredibly James Hicks fielding on the boundary was able to pluck a catch from the gloom and seal a win over the tournament favourites. More details and photographs will be posted later. Records were smashed at the Hatherley and Reddings CliMAX-Sixes tournament on Sunday 5th September. Nathaniel Gregory became the first to go beyond a kiloMAX sequence scoring 111,113 from one over of paceman Pigott. Minutes later James Harber of Painswick CC smashed every ball of one over out of North Park. The final delivery from which he scored one millions runs earnt him the Champagne Moment. 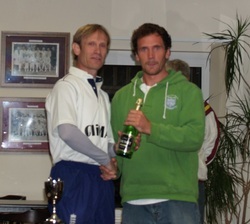 He is pictured here receiving his reward from game creator Peter L Gregory. The Hatherley and Reddings CliMAX-Sixes tournament was given a boost when reporters from the Gloucestershire Echo mentioned it on Saturday. Follow the links for latest team news for Hatherley and Reddings CliMAX-Sixes tournament on Sunday 5th September 2010. Read about the injury worry of Academics Captain Cupper. Following the tremendously successful launch of CliMAX this season, a planning meeting was held at Ebrington CC club house on 25 August 2010. The CliMAX community contributed their ideas for CliMAX next season and beyond. A key decision was to call this a Project Plan and not a business plan as realistically the best we can hope for is a cost neutral enterprise. We also agreed that the priority for next season was to play some hard fought competetive CliMAX matches and this might be best achieved by a league of cup competition involving local teams. Please let us know if your club would like to be involved. Ebrington is in North Gloucestershire - a charming village of the Cotswolds. If you are too far away for midweek evening games or Sunday fixtures, we would support you to set up your own leagues or tournaments. Would you put your shirt on them? 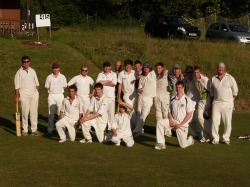 Ebrington CC pictured here after putting on new shirts with the Ebrington and CliMAX logos. 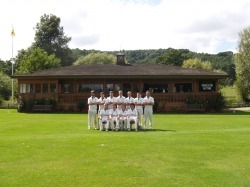 The team are infront of the pavillion, of perhaps the most beautiful cricket ground, Dumbleton CC. Dumbleton are a very strong club, but could not find a way to stop the team from Ebrington that have strengthened their traditional cricket skills by playing the more challenging version - CliMAX - throughout this summer. The face of CliMAX, Josh "Mongoose" Collins, scored 60 and the most feared MAXimum makers Duckie Clarkson and Nat(e) Gregory smashed rapid 40s to help Ebrington to a total of 260. Dumbleton were never in the picture. Andy Edwards captain of one of the CliMAX-Sixes teams on Sunday 5th September 2010 at Hatherley and Reddings Cricket Club, throws down the gauntlet to others contemplating competing in this historic tournament when CliMAX moves away from Ebrington for the first ever time. Andy battered a Stroud league attack to all parts of North Park, Shurdington Lane, finally run out in the 45th over with a massive score of 147. He hit two enormous sixes and rehearsed front foot drives and pull shots in the middle for three hours. This turn around in form make his team (without a name yet) the bookies favourite. Mongoose Collins proved unbeatable in his pairing with Dan Beasley and walked away with the Grant Trophy presented to the winner of the CliMAX-Pairs competition at Ebrington on Sunday 1st August 2010. Read about it Match Reports. Mongoose gives exclusive interview and you can read it here - interview. •CliMAXers are excited at the prospect of an incredible ’CliMAX’ to their first season. 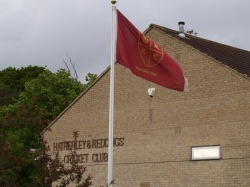 Hatherley and Reddings Cricket Club are providing the venue for the first ever CliMAX away from the dreamy village cricket club at Ebrington. H&R is one of the biggest and most important cricket clubs in Gloucestershire and has two grounds (North Park and South Park) to accommodate a massive CliMAX-Sixes tournament on the same lines as the President’s Day CliMAX-Sixes at Ebrington. It will take place on Sunday 5th September 2010. Don’t miss it! For a report of the last CliMAX click on Match Reports and read about Frosty victory in the pairs with partner Bradders on Sunday 18th July, 2010 at Ebrington CC. The CliMAX game between Stratford and Ebrington is reported in the Stratford Herald (8th July edition) acknowledging the widening interest in the new and thrilling format of cricket that CliMAX provides. The inception of CliMAX has been reported in the sports pages of the local paper The Stratford Herald this week 24 June 2010. In particular, sports editor Dean Bartram, mentions the upcoming match at the Campden Road Ground of Ebrington CC involving Stratford cricketers under the leadership of Will Noble. Players are warned to brush their teeth and have their hair done in case there is a frenzy of photographers and journalists! Long Compton CC became unexpectedly involved in CliMAX after tea at Ebrington today. 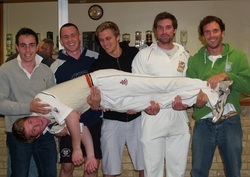 As the players of the reforming club got the hang of the new format, more records were broken. You can read about these in Match Reports. Why do you think these two CliMAX originals are pictured together with broad grins? News of CliMAX from the 15th June will follow soon. Click here to read about it. If you logged on to the CliMAX website on Monday 14th June 2010, you were far from alone. The pages were accessed 245 times by 176 'unique' visitors. You seem to be part of a powerful movement! Potential business partners take note. Read how Callum Stewart's team won the Cup. With Coventry West Indians home venue double booked on Sunday 6th June, Ebrington were forced to make last minute rearrangements. “CliMAX” leapt straight to skipper Tom Clarkson's mind. No sooner thought than the clouds gathered over the Campden Road Ground. The start was delayed an hour, but the rain could not prevent the CliMAX originals completing a 7-a-side game. Clarkson opened his side’s batting with Ben Pigott and Josh ‘Mongoose’ Collins. The Mongoose delivered up consecutive boundaries, but it was Pigott who gave us the day’s first MAXimum. Collins then seemed fooled by a series of wides and missed a rare straight one, providing Dan Knight a precious wicket on debut. Incoming Jack Sexton managed to get off strike with a single and then spent the rest of his time at the non-strikers end until the penultimate over bowled by Cullen. Meanwhile, the very reluctant-to-bowl, Ashley Cartwright took Pigott’s wicket with his first CliMAX delivery. 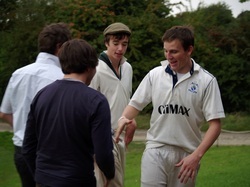 His return of 1 for 6 was the most economical of the afternoon, though he was cut exquisitely for four by Tom Frost. James Hicks was into the action next and bowled Frost for 7 and Sam Elson (0) second ball. Much will be expected of Hicks in subsequent CliMAX matches having a satisfactory analysis of 2 for 28 on his first outing. Sexton, with Clarkson took a cheeky single to bowler Liam Cullen as the ball returned from the boundary glanced his hand, but they had their comeuppance with Cullen bowling Sexton (1) next ball. 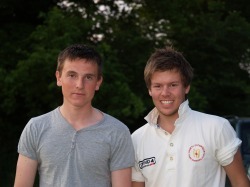 Clarkson was joined by Dan Cross (17*) and the pair provided a solid unbeaten partnership with 30 from 18 balls. Clarkson smashed two MAXimums in his 39* from 14 deliveries. Ash Cartwright and Josh Keyte made a great start with 22 from their first over opening the batting for Nate Gregory’s seven, but the introduction of Josh Collins led to Keyte’s immediate downfall caught and bowled. Bradley Wrench found the boundary three times and batted with the rest of the order except Keyte who was already in the metaphorical dug out. Cartwright (18) was LBW to Elson and Cullen (5) caught off the boot by keeper Pigott off the bowling of Sexton who also picked up the wicket of James Hicks. Sexton’s return of 2 for 23 was the pick of the bowlers in this match. Dan Knight then showed a touch of class with 28 from just 8 deliveries and the only one he did not score off was the one that got him from Dan Cross. Tom Clarkson shouldered the pressure of bowling the last over and snuffed out the vigil of Wrench (17) second ball. Nate Gregory (9*) and Ash Cartwright (9*) were left to try and salvage a victory needing 31 from 8 remaining deliveries. Boundaries came but not MAXimums. They made only 17 and Clarkson’s team ran out winners. Champagne moment – Clarkson’s superb diving catch in the outfield – to no avail as it was a free hit! June Weather is Anti-CliMAX too. It has been said before but is worth saying again; "The weather is anti-CliMAX". We seemed to be waiting so long for this opportunity to play CliMAXin an 11-a-side format. With CliMAX fever mounting we had collected 27 keen local cricketers who were ready to try their hand on Tuesday 1 June, but that morning it started to rain and by 5pm it had not stopped. Groundsman Ken had no choice but to call it off. 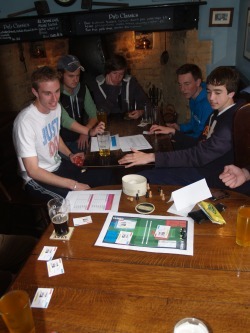 However, nothing really can stop CliMAX, and the 10 players brave enough to turn up were treated to a game of CliMAX-board as well as a nourishing barbecue. The lads really entered into it, donning helmets, holding bats and even umpire Adam Webb slipped on the white coat and raised his finger to Fred Rawlings in favour of Tom Frosts appeal (see picture). A full report of the nail biting proceedings will be made when I have found the scorecards compiled by novice scorers Tom Clarkson and Josh Collins. Meanwhile, I can report that Ken Smith and David Sipthorp cook a great burger! The historic first CliMAX match ever had been completed in just over half and hour, fulfilling one of the aims being to produce a quicker version of cricket, and thereby leaving plenty of time for a second match before the shadows became too long. This time Josh Collin's team took up their bats first, but Josh Keyte contrived to be runout after facing a single delivery. However opening partner Sam Rawlings was soon finding his touch with consecutive MAXimums off unfortunate Adam Webb. Mick Hunt's floaty offies were very appealing to Collins who found his first MAXimum, but was tempted once too often and succumbed with Tom Clarkson taking a secure catch in the deep. Brothers Rawlings then demonstrated a tasty array of shots in a gratifying partnership of 43 with Fred hitting his first MAXimum. Skipper Clarkson had left himself to bowl the pressure over at the death and despite conceding 18 runs found a way past Sam's broad blade and took a crucial wicket. Clarkson proved himself the most effective CliMAX bowler with 3 wickets in the evening. Nat(e) Gregory had only 2 deliveries to post a score for the Collins Six and did well to hit his third MAXimum of the evening, then after taking a single on the additional ball stepped out of his ground to tempt an overthrow, but was fooled by a pinpoint accurate underarm by wicketkeeper Harcourt. All Gregory's good efforts were thrown away in a moment of madness. Jim Harcourt then donned batting instead of keeping pads and came to the middle with young Ben Pigott. The pair were unstoppable. Pigott's two MAXimums were surpassed by Harcourt's three and victory seemed inevitable until Harcourt slightly miss-timed a straight drive off Sam Rawlings toward Nat(e) Gregory on the long on boundary in the penultimate over. He caught the ball inside the fence but somehow contrived to drop it over the boundary. In the gloom, Harcourt and the umpire Peter Gregory presumed the wicket had been taken, but Nat(e) owned up and Harcourt was recalled. There were no more mistakes from the batters in the last over and with their unbeaten partnership worth 90, Pigott (39) and and Harcourt (48) had steered Clarkson et al to a revenge victory. After their first taste of CliMAX, the twelve players and handful of spectators were left gagging for more! Look out for an open 6-a-side tournament on Sunday 13th June and a further evening of CliMAX Tuesday 1st June. Bathed in warm evening sunshine Ebrington Cricket Club hosted the first ever CliMAXmatches on Tuesday 18th May 2010. These were two six a side games, though Ben Pigott was still representing his school cricket team during the first game, so Tom Clarkson's team comprised only five - a notable disadvantage in the field. Josh Collins lead his six into the field and opened the bowling with Josh Keyte of Paxford. Will Noble treated Keyte with respect for 3 balls before clunking a pair of MAXimums. Keyte's return of no wickets for 112 would be bettered in the second game played within the hour. Adam Webb helped Noble take the score to 118 before taking four paces towards a quick single, only to be sent back, slipped up and whilst his legs were still waving in the air heard the death rattle of ball, keeper's gloves, stumps and bails on ground. Keyte was the first victim of over-excitement in CliMAX. Mick Hunt looked composed, but only for three balls; on the fourth he was caught in front and umpire/scorer/game developer Peter Gregory had no choice but to raise a finger and send Hunt on his way out LBW to Sam Rawlings with his first CliMAX delivery. Jim Harcourt strode to the wicket to take on Rawlings in the battle of the giants and did not let his fans down with an immediate boundary. Noble found things a little tough against Rawlings and with two dot balls in the over lost patience and sent a tricky chance out to skipper Collins who was glad to cling on and dismiss Noble for the highest score of the evening - 123 from only 15 balls included a brace of MAXimums. Harcourt and new bat Tom Clarkson were left to re-build against hostile paceman Nat(e) Gregory in the last over. No wickets fell and the undeafeted partnership was worth 10. Nat(e) Gregory was immediately into action again as opening bat and launched his second ball out of the ground. He achieved a further MAXimum in the over of Mick Hunt. 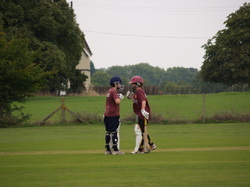 Other boundaries flowed from the blades of Fred Rawlings and Nat(e), including a cheeky reverse sweep, and they had amassed 86 runs when Tom Clarkson brought himself on. Super-skip had Fred caught off his first delivery by Mick Hunt and then got one between bat and pad to dismiss the impetuous Nat(e) for 45 from 11 balls. Rob Sipthorp and Josh Collins played out the overs of Clarkson and Noble as though they had 100 years experience of CliMAX cricket, though in reality this was their first innings. Sipthorp struck the last ball for four, but it was called a no-ball and so had to ensure he did not lose his wicket on the final delivery, a free-hit. That task accomplished easily, he had seen Collins team to a victory by 8 runs. Report of the second game to be posted very soon! CliMAX-Board - the dice game - got its first public airing today after persistent drizzle caused abandonment of the club's league game. The local pub (Ebrington Arms) provided a good surface to play on with suitable beverages to sup. The 'Experienced' took on the 'Enthusiastic', though the crowd (of two plus the barmaid) could be forgiven for wondering into which category Ken fell. Josh rubbed the blue dice on his crotch vigorously but failed to find any swing in his opening over. Nevertheless a straight one did for Herbs who was out third ball. Novice Paul, prodded and eventually lost the strike to Tom who plundered two MAXimums to complete the over on 116. Peter found a way through Paul's defence and Ken took a suicidal run and failed to get off the mark. Tom could only laugh hysterically until he found his way back to the strikers end. Yet again he showed his good form with consecutive MAXes. New boy, Tommo found the boundary no less than seven times, but a massive partnership of 266 was undone by Ben at the start of the last over. He had Tom caught going for another massive blow. It was left to Nat to provide some respectability to the score in an unbeaten partnership of 32 with Tommo who had accumulated 127* in his first CliMAX innings. Tom would have been the star had he not holed out having scored 238. Peter, opening the bowling for the Experienced, was milked by Matt and Josh for no less than 131 and it was not until the introduction of Tom that a wicket fell. Josh had cleared the boundary 3 times in his 31. Jack also found the boundary, but was careless to be run out, sending his team into further bother. The penultimate over was a gem by Paul who's figures read 2 for 12, but yet again Ken showed his genius in withstanding the pressure of bowling last. His slower one deceived Nat and his even slower one deceived Jack at least twice before bowling him. 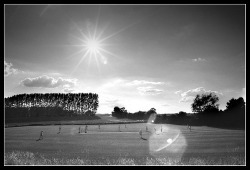 Ben failed to touch the last ball, let alone clear the boundary and the Experienced came out worthy victors by 32 runs. The eagerly anticipated private launch of CliMAX had to be abandoned with the ground under water this weekend. Not even the one delivery required for a result was possible. But the assembled party were not to be totally disappointed as CliMAX-dice provides an attractive alternative. New-boy Will thrust Peter and Janet together in an opening partnership, which proved very productive. Janet took to CliMAX like a duck to water and scored a century of the minimum number of deliveries. With 114 scored Michael was able to tempt Janet into a rash move and had her bowled. Designer Peter showed more discipline against Michael and was able to cash in against Nat during whose spell he became the first KiloMAX (dice) batter. It puzzled all who witnessed it why Peter could not keep his wicket intact, but his dismissal with 3 balls remaining proved crucial. Yes, it has happened! CliMAX has been feigned! The new format of cricket has been simulated with dice and this created a thoroughly exciting experience for all those friends gathered in Peter's living room. Whether four-a-side reflects the number of friends of Peter or the size of his living room, we will leave you to guess, but eight players were enough to secure a flavour of the potential for thrills in CliMAX. Ben struck a MAXIMUM of the very first ball (or should we say, "roll of the dice"?) and repeated this feat three times in the first over. He raced on to 40 and then predictably for a hot headed youngster threw it all away when Tom came on with his tempting leggies. But age is not everything as David proved in padding away after scoring a meagre single, adjudged LBW on another roll of the dice. The very next ball new batter Ken called Josh through for a single and ran the poor lad out before he had received a ball. All this chaos meant in Tom's over three wickets fell for only 8 runs conceded. Father Steve's over brought negligible excitement in comparison with 10 runs and no wickets and the final over of the innings by Liam was miserly with only 6 scored. After all this captain Ben had only 19 runs to defend. Simulating CliMAX - stimulating CliMAX!!!! CliMAX will be launched privately very soon in 2010 at a beautiful village cricket club in the heart of rural England among friends and family of game designer Peter L Gregory. Following this a few local teams will have the opportunity to pit their cricketing skills against this club in the new format. There will be a chance to refine the rules before a more public launch later this year.